This is a firm family favourite and one dish that I grew up with. I’m not sure where my Mother got the recipe, perhaps in Readers Digest, but where ever it came from I always asked for this when visiting and when I moved out and into my own place, this was one recipe I was sure to take with me and I have been cooking it ever since. My wife is not a huge fan as she prefers small pieces of chicken and I always cook this with large chicken pieces on the bone as I think this adds to the flavour and of course I usually have to take apart the chicken for my boys and sadly I have to cook it without the onions! So getting to the recipe, it doesn’t take long to prepare, I don’t even use a recipe these days as I have cooked it so often and will also vary the vegetable ingredients, sometimes swapping the peas for green beans, which also work well! Heat a tablespoon or so of olive oil in a pan and add 2 or 3 crushed cloves of garlic. Season the chicken pieces with salt and pepper and then brown them in the pan. Remove the cloves of garlic from the oil so that they don’t burn as they get a bit bitter when burnt. Meanwhile slice your mushrooms and place in a casserol dish, with the peas rice and pour in the tin of tomatoes. Add the rice and give it a good stir to mix it nicely, then season and add the browned chicked pieces. Pour in the stock place the lid on top and put in the oven at 170 °C for about 40 minutes. 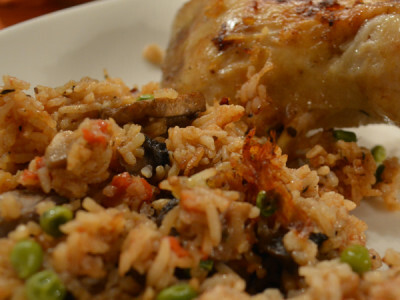 Check to see if the rice is cooked through, if not leave in the oven a bit longer, but usually 40 – 45 minutes should be good. If you want a bit of crust on top then remove the lid and bake for a further 10 minutes.